"The life of the land is perpetuated in righteousness". Living in Hawaii is a blessing and a privilege. It is a sad thing to see this beautiful land mistreated and taken for granted. At the present moment there are many things threatening my adopted island home: over-development with very expensive condominiums and store fronts being built, a growing homeless population not only of locals but most distressing, from outsiders, people of from the mainland who come here because they think life will be easier. Most of these people have suffer from mental illness. Some are sick and may be a health threat to others. It is tragic that the native Hawaiians cannot afford to find affordable housing in their own land. It is very tragic when they end up homeless through no fault of their own. Another problem is that the traffic on this small island seems to grow worse each day. Other problems evolve out of the traffic problems: short tempers leading sometimes to road rage... the loss of the aloha spirit as people rush to beat the traffic jams. It is no longer a rare thing to hear an angry car horn where once upon a time that was kapu (taboo and simply not done). Another problem is the misguided idea by the powers that be that a rail system will solve the traffic problem. The fact appears to be that the rail project will only burden the residents with a higher tax and a higher cost of living with no date for the completed rail in the near future. My concern is that we don't seem to realize that are taking for granted living in Hawaii. 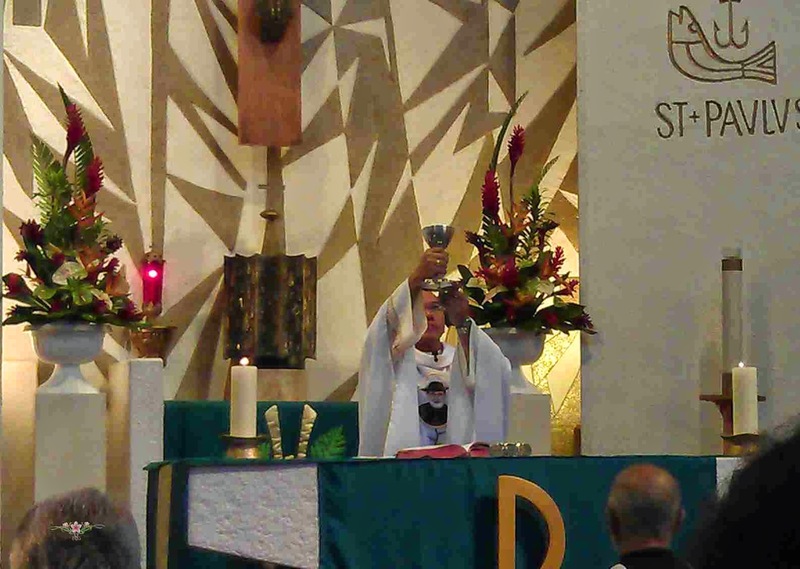 We owe God and the Native Hawaiians the duty of caring for these beautiful islands. We need to take responsibility in caring for the land. 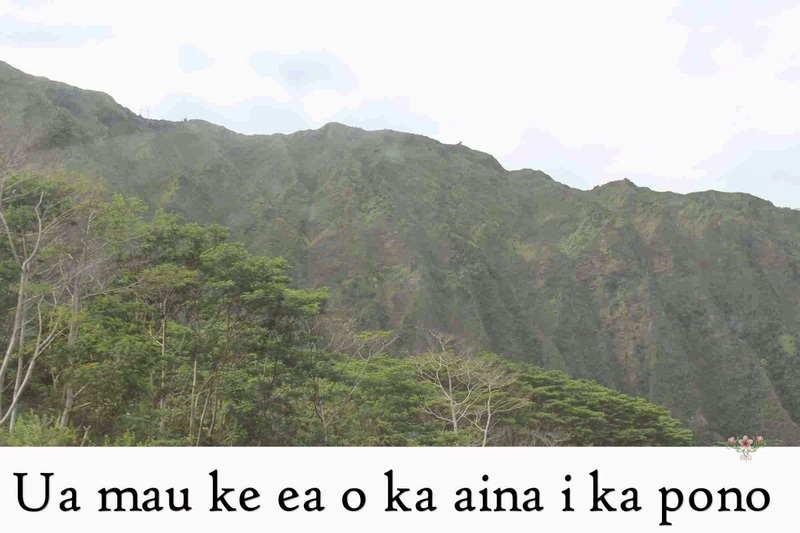 We must do our part to preserve the aina. If we all did our small part, we would preserving this treasured place on earth for our future generation. I do not believe the government can force us to do the right thing. It should be up to the individual to do what he or she can to be a responsible person. We do not need to have to have legislation passed for something that is common sense. 1. Pick up litter. I do not mean our own litter, but also any piece of trash you come across as you walk the sidewalks, parks, hiking or walking on the beach. Carry a bag with you at all times. At the end of your walk, simply toss the trash bag away. 2. Walk. As mentioned above, Hawaii is small. It is therefore unconscionable that some families have multiple cars. Walking will not only be good for your health but it will lessen the tensions among motorists and pedestrians alike. 3. Be a Good Samaritan. Go to the rescue of people in need. By this I mean ask someone if they help assistance, especially the elderly and the disabled. Smile at other people, even if they don't smile back. Show Christian love by acknowledging your brothers and sisters in Christ. But don't stop there. If you see an animal in need, a baby bird that has fallen from its nest, a hungry feral cat, a stray dog, etc. Help them. Show God you acknowledge and respect His creatures. 4. Shopping. Buy local. I can't stress this enough. There are weekly farmer's markets all over the island. Even you don't have one close to you, the supermarkets are now carrying local produce. We have to be dependent on shipments of food from the mainland. That became quite clear with the recent dock strike threat. 5. Grow your own food. Even if you don't have a house with a backyard, there are options. Join a community garden. I highly recommend this because it is a great way to meet really nice folks and share good ideas and tips on gardening and cooking healthy. For those of you who cannot join a community garden, you can always grown food in containers. Good (light) potting soil, sunshine, natural ways of feeding plants, water and a little patience is all you need to grow your own vegetables. I noticed that if you take care of properly feeding and watering your plants, there is a balance that will repel the pesky insects that would otherwise ruin your plants. - Feed your plants with compost. You can make your own compost by either burying the kitchen waste (no dairy or meat) directly into your soil (even in your container grown plants), or start a worm farm or make a conventional compost bin. Bokashi is another option. 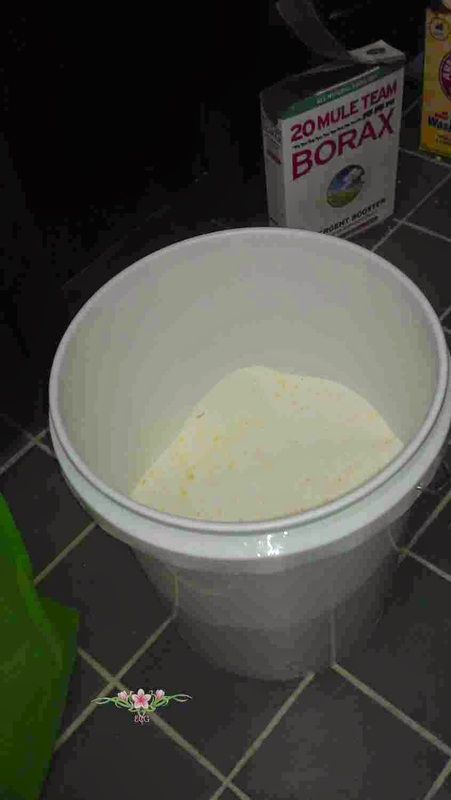 - homemade laundry detergent. This can either be liquid or dry. I prefer the dry. All you need is borax, washing soda and a pure bar soap. The internet is full of recipes for laundry detergent. 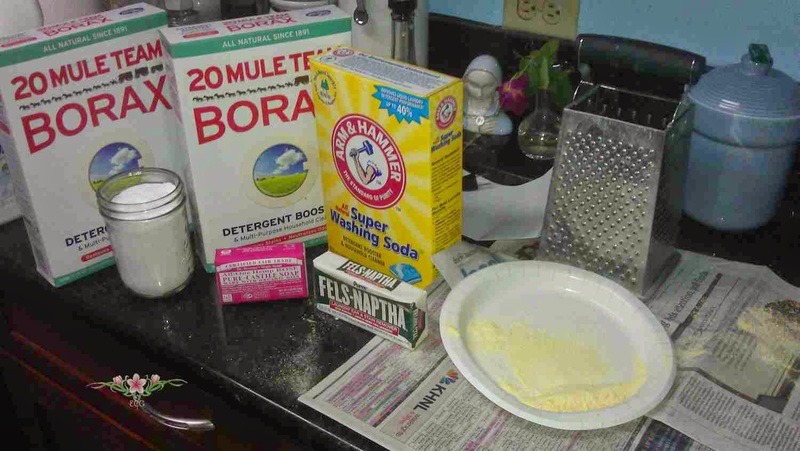 I fill a large bucket with a cover with at least two boxes of borax, 2 boxes of washing soda (not baking soda but you can also add a a cup or two of baking soda to eliminate orders) and two bars of Castile soap. The bar soap needs to be grated and then mix all the ingredients together and you will have a pleasant, clean smelling homemade laundry detergent. Note: to keep the whites white, you will need to add Oxyclean or bleach. Bleach is a harsh chemical so use care if you choose to use it. - homemade liquid Castile soap. Dr. Bronner sells liquid Castile soap but it is a pricey thing to buy even if you dilute it. But you can grate a bar of Castile soap and add to a gallon of water. Let sit for a week or so until the soap melts. Pour into bottles. This soap can be diluted and used as cleaner for almost all surfaces (I don't recommend for granite countertops), hand soap and shampoo. I read some people even use it as a toothpaste but I wouldn't recommend it. - natural orange cleaner. Save your orange peels (making sure to remove the white membrane). Cut into small pieces and place in an empty container. Cover with white vinegar and let sit undisturbed for two weeks or more. This cleaner is good for the granite counter tops. I do not recommend it for white stove tops, etc as it does leave a slight orange stain. But is easily removed by wiping with water. Lemon peels and other citrus peels may also be used. Do not wash your cars with harsh chemicals that will drain into the sewers and ultimately into the ocean. That will end up killing the marine life as well as contaminating the ocean. Use one of the above cleaners and plain white vinegar and water to clean the windshields and windows. Instead of filling the windshield cleaner with pricey store-bought windshield cleaner, my husband fills ours with vinegar and water solution. I clean our windows with the same solution. Buy things that come in glass bottles and jars, not plastic. Reuse these glass bottles and jars by refilling them with for example: dried beans, grains, pasta and the bottles can be used to store liquids. Some bottles are attractive. My pantry shelves hold these recycled glass jars. These are just a few suggestions to practice being a responsible person and caring for the land entrusted to us by God, our creator. In fact, I believe we will be accountable to God for failing to be good stewards of the earth, which He created and all it contains. With a little patience, you an find some decent movies to watch. We subscribe to both streaming and DVDs. The movie listings are not in any particular order. 2. Quiet Victory - The Charlie Wedemeyer Story. People in Hawaii will really appreciate this one. 6. Monumental - documentary by Kirk Cameron on his journey to find the solution to saving America. 7. Stolen Summer - movie about a little Catholic boy out to convert Jews. 8. Redeemed - Christian movie about husband struggling being faithful to his marriage vows. 9. Marty - Classic movie starring Ernest Borgnine as a lonely butcher looking for love. 10. Young Mr. Lincoln - John Ford movie starring Henry Fonda as Abraham Lincoln as a young lawyer. 11. A Long Way Off - a modern retelling of the Prodigal Son parable. 12. The Quiet Man - classic John Ford movie starring John Wayne and Maureen O'Hara. 13. Finding Faith - Christian movie about children preyed on by online predators. 14. Wide Awake - surprisingly good movie about a Catholic boy dealing with the death of his beloved grandfather. 15. Floating City - Chinese historical drama. Very good movie and life, marriage and the Catholic church are shown in a good light. 1. The Flowers of St. Francis, directed by Roberto Rosselini. 3. Drums Along the Mohawk - directed by John Ford. 4. How Green Was My Valley - directed by John Ford. 5. The Identical - an Elvis Presley storyline. 6. God is Not Dead - Atheist college professor tries to intimidate Christian student. 8. Tokyo Story, classic Japanese movie about an elderly couple wanting to visit their children, busy with their own lives. 9. Ikuru - classic Japanese movie about a dying man who learns what is important in life. 1 egg (optional as it may make the dough sticky) use if a nice yellow colored dough is preferred. Make sure potatoes are drained. They should not be watery. Run through a ricer or mash them with a potato masher until completely mashed. NOTE: I like to work dough in a large bowl in order to keep the counter clean. On a clean surface, place the mashed potatoes and add the salt. At this point the egg can be added. Add the flour a 1/4 cup at a time and work it into the potato until the dough is firm like if you were making pasta. It should not be sticky. You may need to add more flour. Now the tedious part, not hard, just tedious. Roll the dough about 1 inch and a half thick. Slice the dough about an inch or so thick. These strips must be rolled out on a floured surface, into approximately 9 inch ropes. Then cut the ropes about an inch or so pieces. Roll with piece on a fork and set aside. 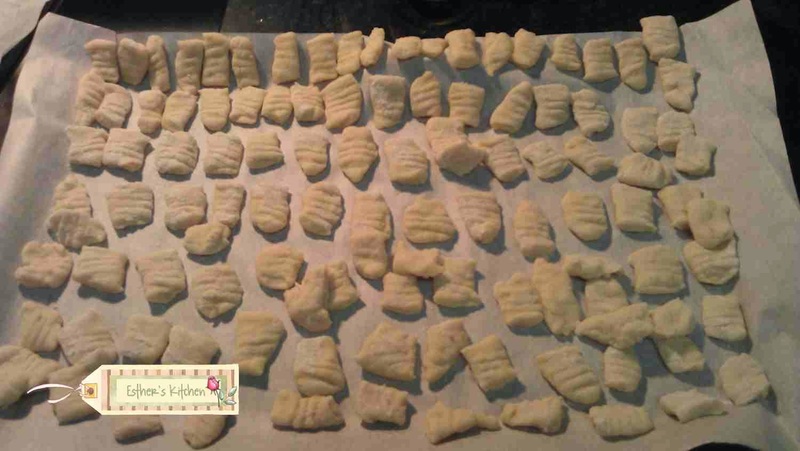 The above photos were my first attempt in making gnocchi so the shapes are not uniform. Bring a big pot of water to boil. 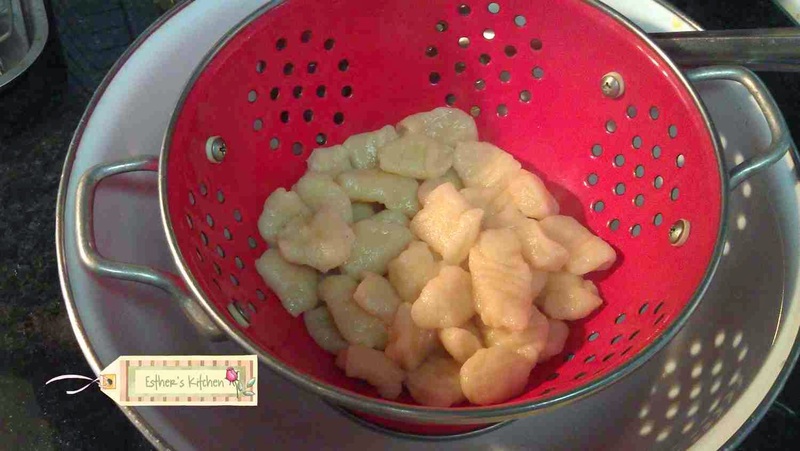 Cook the gnocchi until they float on top. Gnocchi goes well with your favorite marinara sauce or butter and sage sauce. Precious Blood of Jesus, shed in the circumcision, make me chaste of mind, heart and body. Precious Blood, oozing in the Agony of Jesus from every pore, grant me to love above all things the holy and adorable will of God. for my sins and a love of suffering. Precious Blood, falling in profusion from the crown of thorns, grant me a love of humiliations. Precious Blood, shed so profusely in the crucifixion of our Lord, make me die entirely to self-love. Precious Blood, shed to the very last drop by the opening of His Sacred Heart, give me that generous love that sacrifices all to God. Precious Blood, sacred price of my redemption, apply to me Thine infinite merits. Precious Blood, that dost arrest the effects of divine justice, upon sinners, convert them all, but particularly those who are dear to me. Divine Blood of my Jesus, I adore Thee from the depths of my heart; I ardently invoke Thee for Thou art my salvation and by Thee I hope to obtain the joys of paradise.